In ‘London New York Pontycymmer… A day in the artist’s studio,” Tim Dobbs takes us on a tour of Kevin Sinnott’s home and studio. 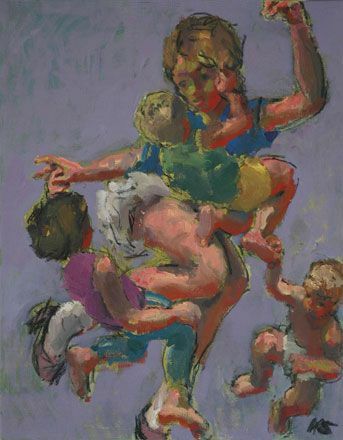 I’d call Sinnott’s painting “expressionist figurative” or “figurative expressionism,” something like that: brushy, splotchy, sketchy, a bit comical in some ways (the few in the zine, anyway: I’m not familiar with Sinnott’s other work), and quite fun. The zine shows the working artist’s tools—brushes, pencils, easels, etc.—the working artist at work—sketching in a hat, jacket and slacks, putting the finishing touches on a painting featuring a young woman, hovering in midair, with a couple of toddlers and a baby hanging off of her, perhaps titled “Supermam,” (a study for it is available on the Martin Tinney Gallery)—and relaxing after a long day. And, once again, I’m deeply grateful to be an amateur and keeping my photography and art separate from my money-making activities, though it looks like Sinnott has a nice enough life. It’s hard for me to separate the subject from the photos… this isn’t a zine of landscapes or street stuff of the usual sort in my small, but expanding, collection. ‘London New York Pontycymmer’ is a biographical essay of sorts, and, as such, it succeeds entirely. Overall, I’d give it 3.7 stars. Dobbs limited the zine to 30, and as of February 10, he was down to 2 copies remaining, so I’d hold out hope for a second printing, if I were you. Follow Dobbs on Twitter, and check out his website too. And if you find yourself in Wales, maybe stop into Sinnott’s gallery and check out some of his work in person.